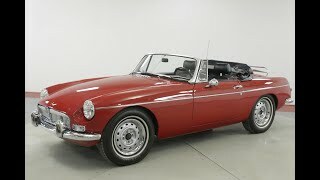 Hi, I am interested in your 1963 MG MGB (stock #MJNT065) listed on Autotrader for $17,900. I'd like to get more information about this vehicle and confirm its availability. Worldwide Vintage Autos is pleased to present this Nicely restored 1963 MG B Roadster. The MGB is a two-door sports car manufactured and marketed by the British Motor Corporation (BMC), later the Austin-Morris division of British Leyland, as a four-cylinder, soft-top roadster from 1963 until 1980. Its details were first published on 19 September 1962.3 Variants include the MGB GT three-door 2+2 coup (1965 1980), the six-cylinder roadster and coup MGC (1967 69), and the eight-cylinder 2+j coup, the MGB GT V8 (1973 76).